For the longest time, the BugE reminded me of some sort of futuristic hovercraft. Ever since I got it, I've wanted to put some lighting on the BugE to give it a "riding on neon" effect. However, I never got around to it. The other day, I was looking at LED lighting and the idea came up again. So, I've decided to add some "bling" to the BugE. However, before I do that, I've decided to upgrade the wiring based on what I've learned from it's time in the field. So, based on my experience, I'm going to make an effort to improve the wiring. The cowl wiring seems to be OK for now. It's got a reasonably simple layout that is relatively easy to troubleshoot. Other than possibly changing out the headlight for an LED headlight, I'm reasonably happy with it. The lower wiring isn't so nice. It became a rats nest ever since I decided to add lithium batteries (due to the extra battery management circuitry). So, I've ripped out the lower wiring and I'm starting over. Perhaps the most important feature if the new wiring is to use a true wiring block. Unlike my past wiring which used numerous taps and in line fuses that was almost impossible to troubleshoot, this new wiring will come together to one location similar to a car. Fortunately, the battery pack is small enough that a wiring platform can be installed next to it. 1) The traction battery (The big battery) needs to be electrically isolated from the rest of the system. That means NO COMMON GROUND between the accessory loads and the traction battery. 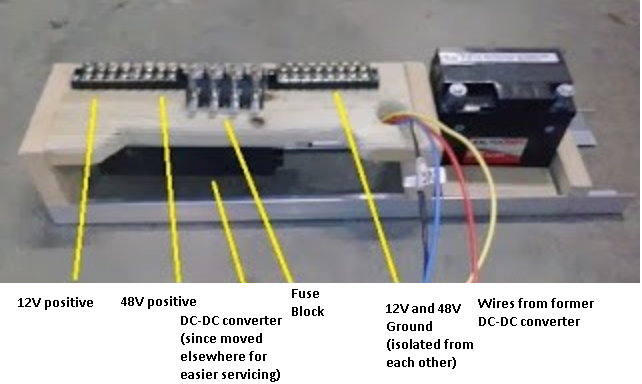 The 12V system should run off of either a totally separate 12V battery or use a good ELECTRICALLY ISOLATED DC-DC converter. 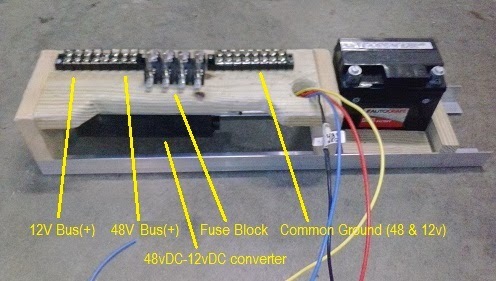 The converter should have (+ -) wires for the 48V side and (+ -) for the 12V side. Although it is very tempting to connect those grounds together to make wiring simpler I burned out my older BMS system trying to make that work. After that expensive lesson, I've learned - keep those grounds isolated! 2) Overcharging a lithium battery can raise it's temperature. That not only can damage the cell but it can also cause a fire. So, it's VITAL that no cell is overcharged. That means the string of batteries needs a BMS system. Most BMS modules work by monitoring the terminal voltages of each cell (and temperature too). If any cell goes over voltage or over temperature, the battery module will try to shunt electricity away from the cell if it can. If it can't it has a mechanism to tell the BMS to tell the charger to stop charging the whole string. 3) When installing a BMS system, it's really easy to damage the individual BMS modules. Before installing a BMS system, disconnect an on-board charger before installing them. Turns out the battery charger has some capacitance in that has the potential to fry individual modules. 4) Although on the surface, the wiring doesn't look all that different, the addition of a wiring block eases troubleshooting and also allows for quick wiring changes.